If you're not a fan Japanese katsu, you might want to tune out now. A lot of what follows is going to be me gushing about a particular bowl of katsu curry from Kyodai Katsu on Koornang Rd. No apologies—it was bloody amazing. Kyodai Katsu is a salmon-y pastel Japanese katsu bar that popped up about five months ago. It’s actually quite gentrified for Carnegie. This is one of Melbourne’s favourite restaurant strips, but it’s never been what you’d call ‘cool’. No-one ever bothered with things like minimalist branding and cohesive interior design, they just pumped cheap dumplings into your veins. In a way, it would have been less risky for Kyodai to just throw some Formica tables together and have everyone sit under a buzzing fluorescent light bulb. 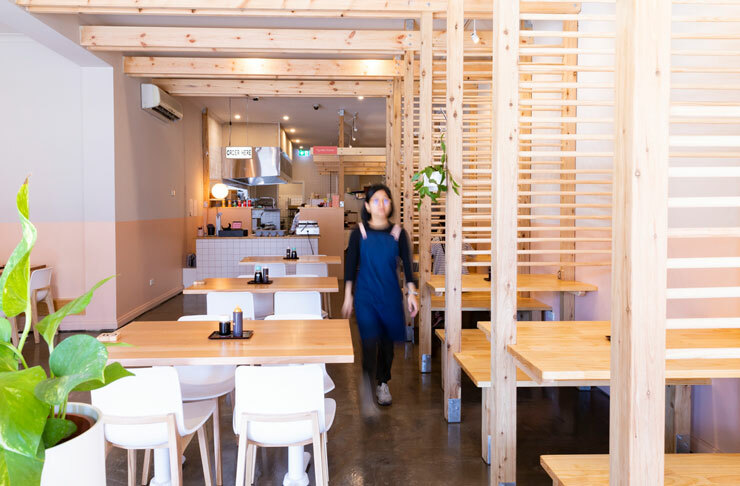 Instead, they’ve gone with a cutesy-Japan-meets-Wes-Anderson vibe—blonde timber booths, white subway tiles, buff concrete, peach tones and clean lines. It looks slick. Okay, onto the katsu curry. You don’t have to get the curry here, obviously. They also do katsu don rice combos, or Teishoku set meals, which come with panko-crumbed pork, chicken, rockling or tofu, plus steamed rice, salad, pickles and a big miso hug. Katsu is the common theme running through the menu. If you don’t like katsu…go somewhere else very fast. I ordered the panko pork curry, which arrived in a very generous bowl—soupy brown kare sauce lapping against a mound of sticky white rice. The pork was perched up on the rice, above the curry tideline, preserving its panko-crumbed crunchiness (nothing worse than seeing crispy panko pork slowly sink into your curry like quicksand). The panko crumbs at Kyodai are house-made, and you can tell. They look like a cross between fried cornflakes and bonito wafers. The chefs here cook their bread with an electric current (to avoid a crust), then grind the result into something resembling angel’s dandruff. Coat meat, deep fry, and bam—the perfect katsu crust. This stuff is so crispy I swear I heard my bowl rustle when it was placed on the table. The curry sauce is everything you want from a good tonkatsu. Brown, mysterious, with that viscous, starchy texture you don’t get anywhere else (a proper Japanese curry is actually made with a roux, like white sauce, which gives it a vaguely snot-like consistency). Baby-soft carrots and potato are the only source of vegetable, but you can tell they’ve been simmered to remove anything even resembling a vitamin. A nice touch here: Kyodai serve their tonkatsu curry with a free bowl of thinly-sliced carrot and cabbage pickle. I haven’t tried tonkatsu with pickle before (apart from the luminous red beni shoga or fukujinzuke that float in every bowl)—it zings off the porky-richness really well. For dessert? It’s got to be two of Kyodai’s made-to-order Nutella taiyaki cakes. Taiyaki are those little fish things you see at some of Melbourne’s hipper Japanese restaurants (Supernormal Canteen, for one). Usually, they’re filled with red bean paste, but Kyodai stuffs theirs with Nutella, then fries them in a special waffle-press type machine. 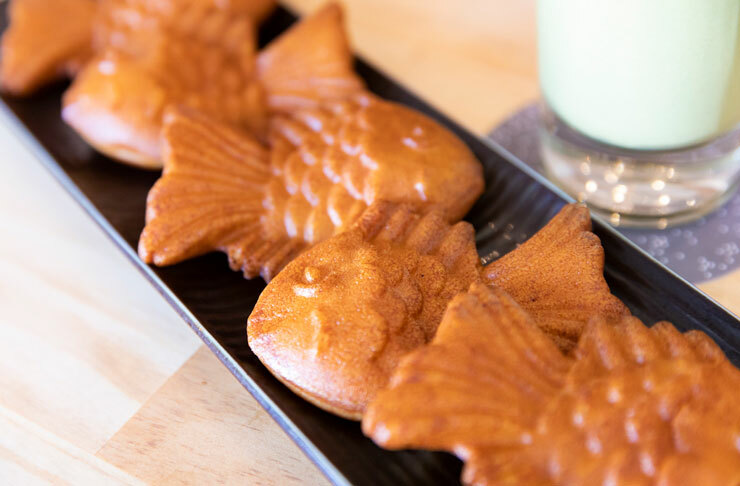 Be advised: they have a minimum order of two, so bring a friend if you want to avoid post-taiyaki guilt. I have no idea why, but Koornang Rd suffers from some kind of crippling EFTPOS phobia. Even consciously trendy places like this one. This is like the third time I’ve reached a register, only to see a laminated ‘Cash Only’ sign, and had to dash across the road to the ANZ ATM to withdraw strange plastic tokens. Is Koornang Rd owned by some Korean crime syndicate who only deals in cash? If anyone knows what the deal is, please let us know. So should you check this place out? Very much yes. It’s easily one of the Top 5 katsu curries in Melbourne right now. Just remember to bring cash. Want to learn more about Kyodai Katsu? Check out our Directory page here. Did you hear that The Espy is back? Read all about how it's shaping up right here.